The place to be Saturday night is the Mineral Point Opera House for the third concert in the series ” Local Bands for Community Causes.” This time, the cause is the Opera House itself seeking to upgrade its sound system and the band is Better Daze. Here’s a clip of their version of “I Shot the Sheriff,” http://www.youtube.com/watch?v=jpkI2nspIL8. Now, let’s meet the four members of Better Daze. Steve Brown was bitten by the music bug at an early age after his parents took him to a concert at San Francisco’s Winterland Auditorium as a seventh grader in the late ‘60s. Steve doesn’t remember exactly who was playing that summer evening, but frequently comments on how good the Kool Aid was. Since then he has played with many bands including the long-running Illinois-based blues band Dealin’. John “Johny Rocket” Haarbauer hails from the hardscrabble hills of eastern Pennsylvania. According to the band, this guitarist/vocalist/harmonica-ist has an extensive musical resume stretching from the barracks-circuit of the Oklahoma panhandle to east coast venues that could have seen the likes of Sinatra and Springsteen – if either of them had never made it big in the music business, that is. Dave Hopper (bass and vocals) takes credit for all Better Daze’s low points (musically, that is), but began his musical career playing guitar in his high school days. 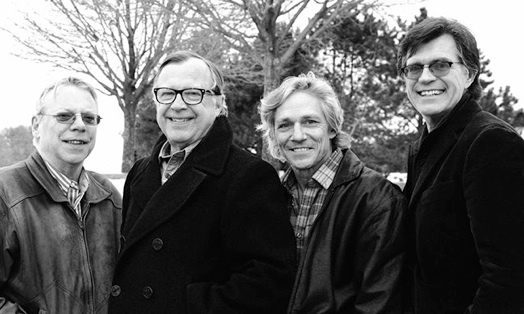 Dave has sharpened his chops in numerous bands, including Mineral Point’s memorable trio “151”. He is the band’s sound tech and as his band mates like to remind him, he actually puts the “Daze” in Better Daze. Rob Steffen (drums) is described by the band as “a perfect example of the difference between a drummer and a savings bond — the difference being that only one will mature and make money.” After a long, mildly received stint with Rob and the Electrodes back in the ‘70s, he resurfaced with Chicago’s Laughing Boys in the mid 90s. He asks that you don’t hold either against him. 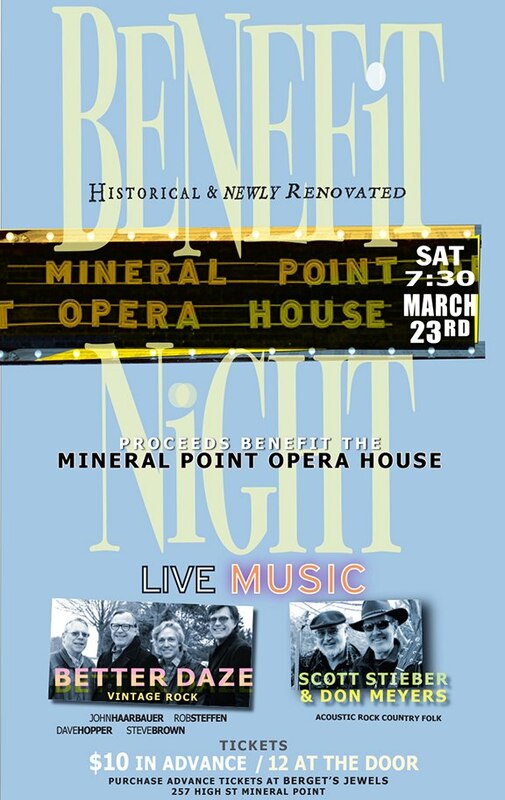 Come see Better Daze and SDS in the beautiful Mineral Point Opera House, Saturday March 23rd at 7:30 pm. Gallery | This entry was posted in Entertainment, Music, People and tagged Better Daze, Dave Hopper, Don Myers, Johny Rocket Haarbaur, Mineral Point, Mineral Point Opera House, Rob Steffen, Scott Stieber, Steve Brown, Wisconsin. Bookmark the permalink.